Seven-time champion Rafael Nadal beat Andy Murray in a brilliant three-set thriller to reach the Italian Open semi-finals in Rome. Murray looked on course for his best-ever result on clay at 4-2 up in the decider, but Nadal hit back to win 1-6 6-3 7-5 in two hours and 40 minutes. Nadal, 27, will play Bulgarian Grigor Dimitrov in Saturday's semi-finals. Murray, who turned 27 on Thursday, now heads to Paris for the French Open, which gets under way on 25 May. The Scot could take heart from his efforts in Rome, where he picked up two wins on the clay in earlier rounds before extending the world number one to three sets on a rainy night in the Italian capital. "I'm getting close to getting back to where I want to be, and that's pleasing with a couple of big months ahead," said Murray. "Tonight was probably the best I've hit the ball for a while, and the best I've felt physically since the [back] surgery [in September]." It was the first time the pair had met since Murray's victory in the Japan Open final two-and-a-half years ago, which he finished off with a love set, and the Wimbledon champion picked up where he had left off in Tokyo. Murray reeled off the opening five games as he did a terrific job of denying Nadal opportunities to use his fearsome forehand, with a first-serve percentage of 80% keeping the Spaniard on the back foot. Nadal has been searching for his very best form throughout the clay-court season but, once he saved an early break point in the second set, the 13-time Grand Slam champion began to take control. He finally broke the Murray serve, now down to around 50%, as he moved out to a decisive 3-0 lead, and a double-fault on break point at the start of the third appeared to signal the Briton's challenge was fading. Far from it; a breathtaking winner hooked over his shoulder helped Murray back to level terms and, with the momentum on his side of the net once more, the Scot had a landmark victory in his sights at 4-2. Nadal remains the most obdurate opponent in tennis, however, and he grew stronger with the finish line approaching. Murray could not hold off the Spaniard's charge and another double fault on break point at 5-5 allowed Nadal to close out the win as he took 12 of the last 13 points. 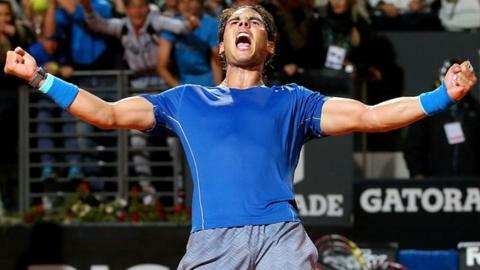 "The physical part is really good, the mental part too, and my tennis is going to be there sooner or later," sais Nadal. "This was one of my best matches in a while." Murray admitted: "That was my chance [at 4-2] and I played a poor game, so I'm disappointed with that. Earlier, two-time champion Novak Djokovic edged past Spain's fifth seed David Ferrer 7-5 4-6 6-3 and he goes on to face Canadian eighth seed Milos Raonic, who beat Jeremy Chardy 6-3 5-7 6-2. Dimitrov went through when Germany's Tommy Haas retired with a shoulder injury. In the women's draw, Italy's Sara Errani upset second seed Li Na 6-3 4-6 6-2 to set up a semi-final against Serbia's Jelena Jankovic, who beat third seed Agnieszka Radwanska 6-4 6-4. Eleventh seed Ana Ivanovic beat Carla Suarez Navarro of Spain 6-4, 3-6, 6-4 and goes on to meet top seed Serena Williams, a 6-1 6-3 winner over Zhang Shuai of China.